If you are a creator or an online influencer, FlexClip Video Maker can be a boon for you as it is free to use, and you can get all your job done quite effortlessly with it. It is hard to expect all the features of a premium video making/editing tool to be available in FlexClip, as that will not be feasible. Software suites for video making and editing are abundantly available in the market, where some are free, while most others are paid. There are even some open-source video editing tools, which can offer a decent set of functionalities to fulfil all your needs. But the domain of video editing isn’t that miniature, and there are a number of possibilities when it comes to video making and editing. If you are a professional and work with videos almost every single day, you might need a full-fledged video editing tool like Adobe Premiere Pro or Sony Vegas Pro, none of which isn’t easy at all for the newbies. On the other hand, if you edit videos once in a blue moon, or do not want so many features that the premium video editing suites have to offer, it isn’t going to be profitable for you to go through the learning curve of those complex video editing suites in the first place. It isn’t going to be a real deal for you to purchase such video editing suites if you don’t need all those premium functionalities but get the same at your budget or for free. That being said, if you want to make video slideshows, or want to upload videos to streaming sites like YouTube, you can get your job done, even without paying a premium for such video editing suites. So I am using the FlexClip Video Maker for quite some time now, which is a decent piece of program that can help you make video slideshows, add music, voiceover, photos to it, without spending a second to learn using it. Yes, it’s that easy. So let’s get started with the features, the way to use, the pros and cons of FlexClip Free Video Maker. Let’s start talking about FlexClip free online Video Maker with the features the platform has to offer. The first thing that comes to mind, while you make up your mind to start using some software is its price. Talking about the online version of FlexClip Video Maker, it is completely free to use, however, it is also available for Windows 10 desktops from the Microsoft Store at just $3.87 or 269 INR. FlexClip Video Maker has support for timeline feature, which can help you to add videos and photos one after another and make a slideshow or create a photo/video album with the photos and videos that you have in your hand. The platform has support for different type of actions that can be performed on the videos, photos, and music, a few of which are trimming audios and videos, rotating images and videos, merge or watermark videos and a lot more, not to mention, it also has support for adding voice-overs. Videos can be exported to different resolutions, 480p being the lowest, to as high as 1080p resolutions. The videos are exported to mp4 formats. FlexClip has support for different aspect ratios to suit your exact needs, and they are 1:1, 9:16 and 16:9. How to use online FlexClip Video Maker? Now let’s peep into how you can get started with FlexClip Video Maker. It has numerous features, and I cannot mention each of them individually. I am just talking about the basics. Just start using it to unravel the other exciting features FlexClip Video Maker has to offer. Step 1: Open flexclip.com and enter your email ID to get started. You can even sign up using your Facebook account. 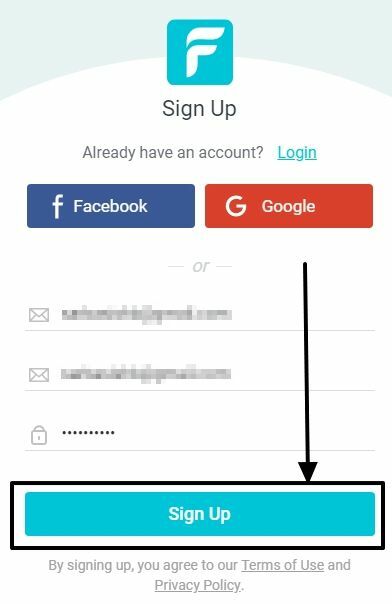 Step 2: Now complete the signup process using the email ID, password, and other necessary details. Step 3: Once you are done with opening your new account on FlexClip Video Maker free, you will get access to the dashboard, where you can get started with a new project, or edit an existing project. Just click on ‘Create New’ to start creating a new video. That will be the only option available on opening FlexClip Video Maker for the first time. Step 4: Here you will get the interface to create videos. 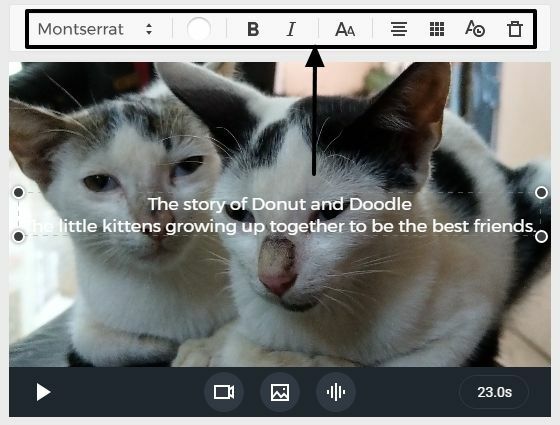 Just move the mouse pointer to ‘Storyboard’ on the down left corner of the screen to execute the first steps of making a video by adding a photo video or a background image. Step 5: Once you are done adding all the images and videos using the same tool, you can now add voice-overs, music files to personalize your video in all the possible ways. If you are done doing all that, you can reorder the images and videos for the final cut. Step 6: You can even select the texts to appear whenever you want in a particular frame. Just select the text and then click on ‘Adjust Text’ to change when the text appears on the timeline. You can even customize the text by changing the font colour, size, italicize or bold it, etc. 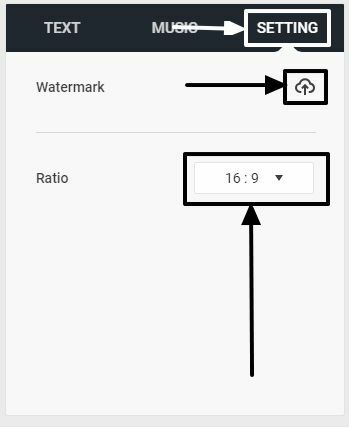 Step 7: To change the aspect ratio or to add a bookmark, just click on ‘Setting’ and upload an image to use it as a watermark or change the aspect ratio, or do both. Step 8: Once you are done with everything, you can preview the complete video by clicking on ‘Preview’ or click on ‘Export Video’ to download it on your computer. You can even click on the play button for the individual slides to preview them. 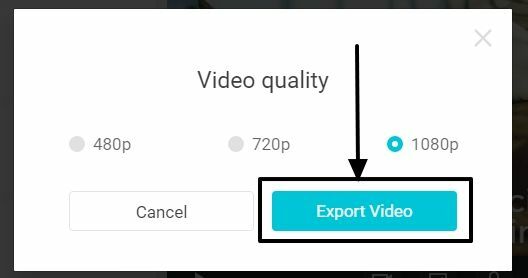 Step 9: If you want to export the video, just choose the appropriate resolution and click on ‘Export Video’. Step 10: It will take some time for the export process to be complete, and once it is over, the final video will be downloaded to your default folder for downloads. So that was the basics of how to get started with FlexClip Video Maker. You can also add logos to your videos, which is an added functionality. 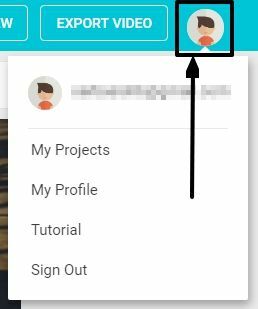 Just move your mouse pointer to your profile icon, and select the appropriate option to see your old projects, edit your profile, see a small tutorial of FlexClip Video Maker or simply to sign out. Now let’s talk about the pros of FlexClip Video Maker, and the reasons, why you should choose it for all your basic video making needs. First things first. The bottom line of FlexClip Video Maker is its easy-to-use interface. FlexClip Video Maker is really easy to use, and thus, using it will not at all be a challenging task even for the newbies. Though FlexClip Video Maker is an online tool, videos get uploaded in no time, which should keep your headache aside if your service provider heavily limits the upload speeds on your network. FlexClip Video Maker has support for almost all the major video formats of today, which include MP4, OGV, WMV, AVI, MPEG4 and what not. So your collections can be any format, but FlexClip Video Maker has got you covered. FlexClip Video Maker has support for live preview, which can be very handy to preview the applied text and video effects instantly without manually previewing every single time. This feature is quite handy if you want to apply the most appropriate effect in no time. Just like other video maker programs, FlexClip Video Maker has support for all the basic functionalities most newbies or amateur users will need for making videos or beautiful slideshows for marketing and other diverse purposes. FlexClip Video Maker is a freemium tool. 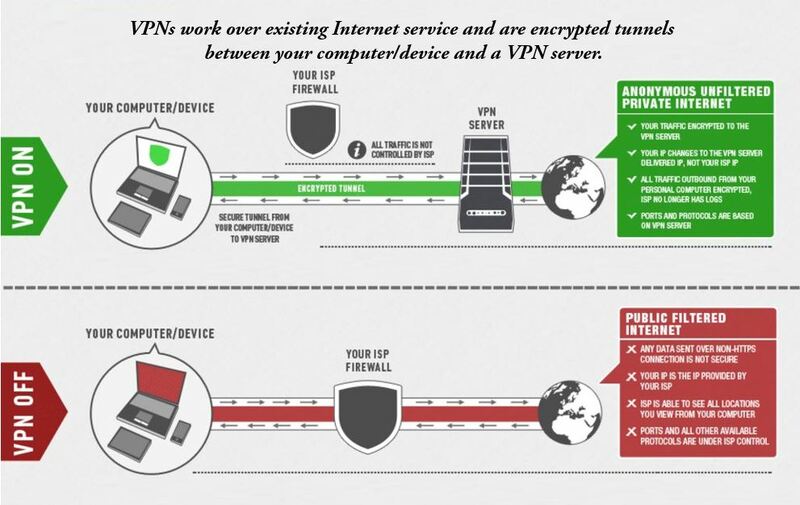 The online version is free to use, while you will have to pay for using the offline version, which has similar functionalities. For the price it is offered at, FlexClip Video Maker is a real deal, but it doesn’t mean it cover the requirement for all types of users. There are some limitations, as well, which I will be mentioning here. 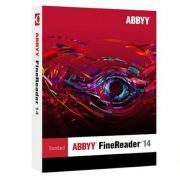 But none of them, however, is a deal breaker considering it to be free or the price, the desktop version is offered at. Though 4K isn’t a widely accepted resolution for its extravagant hardware requirements, there are still a handful of users, who have 4K displays or record 4K videos. I wish FlexClip get support for exporting videos to 4K. Cloud computing and cloud storage services are hot cakes in today’s world of technology. But unfortunately, FlexClip Video Maker don’t have support for exporting or adding videos, photos or music to and from the cloud. Adding and exporting elements is only available from the local system. The support for cloud storage services will make FlexClip even better. Though the 4:3 aspect ratio, which is meant for SD televisions or monitors, isn’t that popular today, 4:3 can still be useful for the purpose of marketing, as that is compatible with all devices. But the 4:3 aspect ratio isn’t available on FlexClip Video Maker. Hopefully, the developers will add support for exporting videos to this aspect ratio soon. Though you can import or add videos of different formats to FlexClip, videos created using FlexClip Video Maker can export videos only to mp4 format as of now, which undoubtedly is quite popular and is compatible with most devices today. But the support for other latest formats like FLV is something most users will need. This isn’t a deal breaker, but I wish, there were support for more formats to export videos. 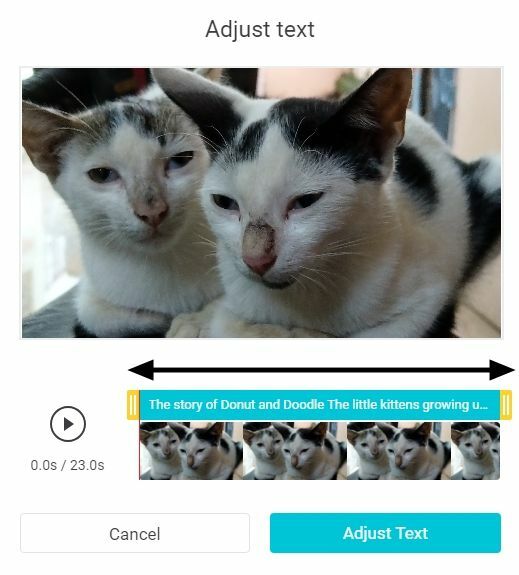 Though it is possible to add texts to photos and videos and make them fade away after a few seconds, I didn’t get an option to add multiple texts to videos and make them appear at different intervals. For example, the first sentence should appear for the first 3 seconds of the video, the next in the last 5 seconds and so on. This is useful functionality, which I think will be added by the developers soon. FlexClip Video Maker is still at its Beta stage, and it is useless to expect all the features to be available at this point of time. The cons here are the areas, where FlexClip can rock. Hopefully, the developers are reading my article, and they will execute the next steps the way I want. It might sound selfish, but I am not. Those were the things, which I think could be improved. You can leave your comments below if you think there are additional chances for improvements. Now to the final part. FlexClip Video Maker is a cool website, where you can play with your videos to create something new and appealing. If you are a creator or an online influencer, FlexClip Video Maker can be a boon for you as it is free to use, and you can get all your job done quite effortlessly with it. It is hard to expect all the features of a premium video making/editing tool to be available in FlexClip, as that will not be feasible. FlexClip Video Maker is free and considering that there are not a number of areas, which should be complained about. That was all about FlexClip Video Maker. 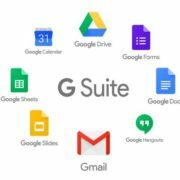 Do you have any views about the website or software? Feel free to comment the same down below.